How will the Trump tax plan change YOUR taxes? Will the GOP tax plan lower your taxes or raise them? The House and Senate are expected to pass the final version of the tax bill this week, but polling shows that most Americans don’t expect the bill to benefit them. With this calculator, find out if that’s the case. The calculator doesn’t incorporate every provision of the new tax code, but enough to make an educated guess. 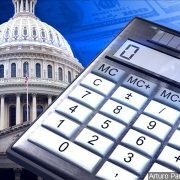 Click below to get a simple estimate of your tax cut or hike. Housing prices are rising much more quickly than wages in the Asheville Area. Experts agree this is negative, but they don’t know what the ultimate consequences will be. Is It Time To Make Changes to Your Investment Portfolio? The stock market has taken us for an emotional ride during the past couple of months, and you may be asking yourself if you should make changes to your investment portfolio. While changing strategies can be a good idea, it’s better to base those decisions on analysis and in the context of your long-term investment plan rather than on emotion. Before changing your investments, consider whether or not your response is an overreaction to the news. It is always good to review your portfolio on a quarterly or annual basis to make sure you are on track to reach your goals. Click here for the questions you should ask yourself when thinking about making changes to your investments. https://www.horizonswealth.com/wp-content/uploads/2019/03/Horizons-logo-retina.png 0 0 David Hunter https://www.horizonswealth.com/wp-content/uploads/2019/03/Horizons-logo-retina.png David Hunter2015-10-07 16:22:422019-03-24 22:10:39Is It Time To Make Changes to Your Investment Portfolio? So, how do you stop the market from making you crazy? The current market is a reminder that days sometimes feel long, while years pass quickly. Don’t confuse that feeling and make long-term moves based on what’s happening on any given day. That’s how years pass and you wind up short of your goals, when the odds were in your favor that staying the course would have paid off. Horizons Wealth Management provides Fee-Only financial services customized to meet each client’s unique needs. The result is unbiased financial advice from professionals who are committed to acting as a fiduciary in a client-centered relationship. We analyze all aspects of your finances to design a roadmap to help you reach your financial goals and provide you with peace of mind.